My husband’s family moved to the US as religious refugees 20 years ago. They were not able to openly practice Judaism in their native country. Today we are grateful to be able to fill our home with menorahs, blue and white decorations containing the Star of David, and books about Hanukkah (and other Jewish holidays as well). Last night my husband’s parents and grandmother came up and the boys celebrated with their grandparents and great-grandmother. We lit the menorah, and played dreidel, and, of course, the boys received presents. My in-laws do not stick to the 1 small present idea – the boys made out like bandits (actually, the adults also received lovely gifts). We set the mood with music from Chanukah at Home , a new discovery of ours this year. Dinner was a mix of Ukrainian and traditional Hanukkah offerings- featuring latkes piled with applesauce and sour cream, as well as borscht. 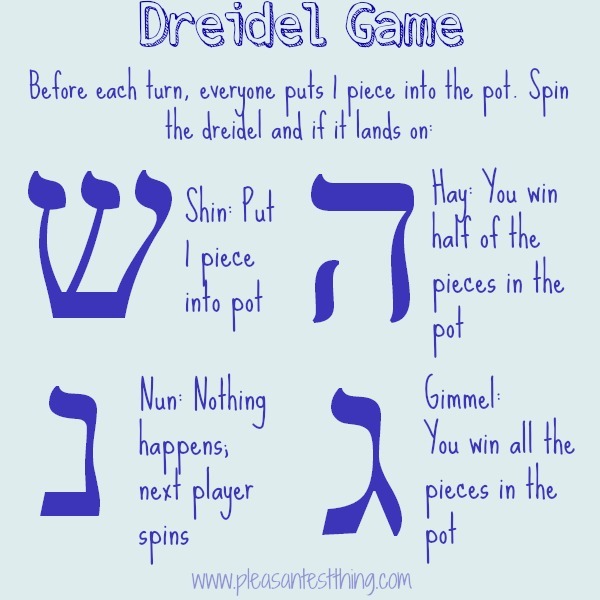 My preschooler’s favorite Hanukkah activity is playing the dreidel. We give everyone the same amount of a small object- raisins, or stickers, or Hanukkah gelt (gold-foiled covered chocolate). We then follow the rules in the picture below. Happy Hanukkah to all of you who celebrate it and your families! 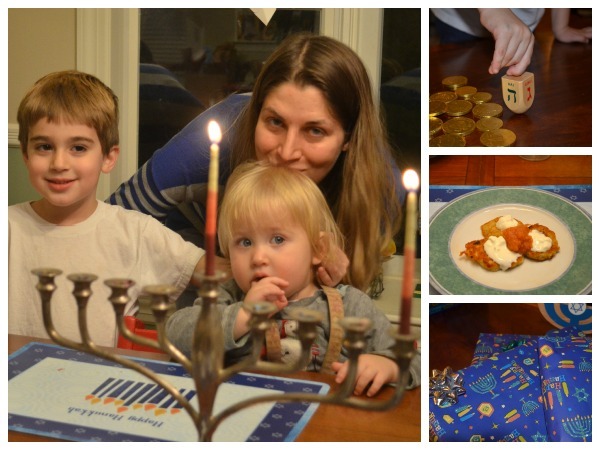 I have been pinning Hanukkah ideas for families to this board, if you would like some inspiration. Disclosure: The Amazon link is an affiliate link.